To this picturesque portrait of a Highland piper a particular interest is attached. It is a reproduction of a painting from the brush of a famous French artist, Raymond Desvarreux, to the order of the French Government. 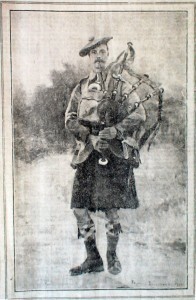 The Highlanders who had the distinction of posing as the model for the picture is Piper James MacNiven, Argyll and Sutherland Highlanders. He is a native of Tiree where he was born forty-five years ago, and is the eldest of five brothers, who are all in the Army. Rev. John MacNiven, Paisley, is a cousin. The gallant piper stands well over six feet in height, and has seen much active service in France with his famous regiment. 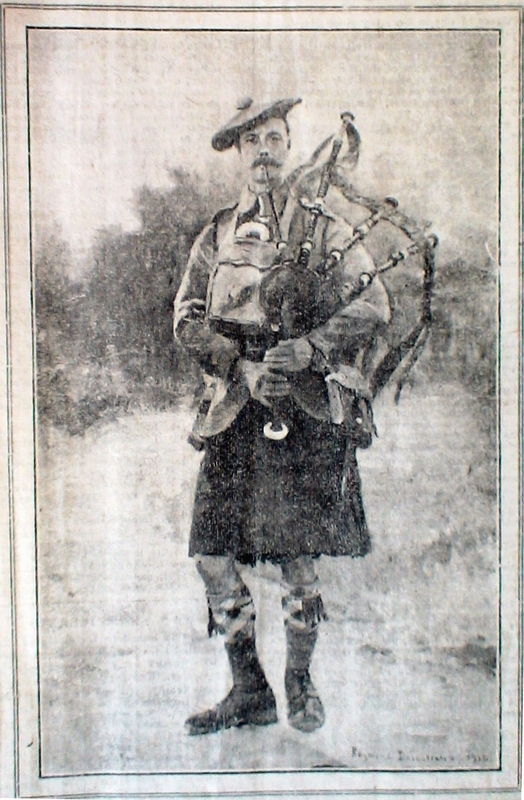 This fine picture of a representative Highland piper, we may be sure, will be highly prized in France, where the deeds of the Highland regiments are classic, and among his people the bagpipe has inspired a most devoted affection. Upon the north wind ‘neath the list’ning sky? As proud the kilted Highlanders go by. And tramp of marching man in it. And strength that kings defied in it. That we may ne’er forget in it. Adown the fleeting years and it. That calls the wand’rer home in it.